In case you hadn't heard (kidding), we got some snow in CT. I know I'm a little late but it was a storm like I've never seen in my lifetime. Apparently there was another but it was in 1978 so that would make me two and clearly I can't remember that far back. People were freaked out that they couldn't get out of their houses. Seriously some were stuck for days. I enjoyed my time with the girls. It was nice not to have to rush around anywhere. We crafted, baked, and watched way to much TV. It was nice to be home. So I got a week of unscheduled vacation and now it's their February break and we get to spend another week together which I'm ok with. Although I'll be saying something else when we're all in school until the end of June. Anyone who knows me can tell you I am afraid of heights. 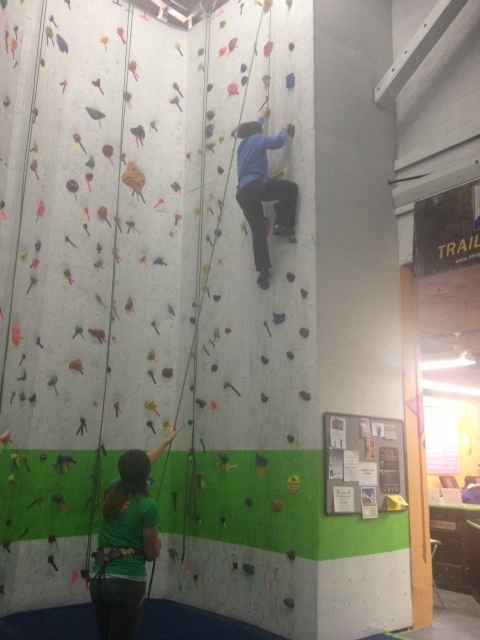 So, why would I go rock climbing? I have been trying to push myself. I want to try new things and get myself out there. I want to get moving and really try to be more active. Some friends and I went rock climbing and it was so much fun. Even though my whole body was shaking, I was sweating, and I was uncomfortable the entire time...I kept trying. Along with being active I've also been trying to eat healthier. 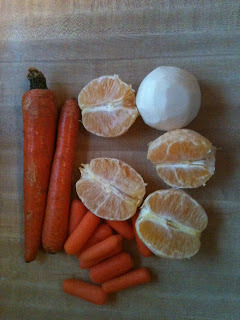 I've been juicing in an effort to get more veggies into my diet. 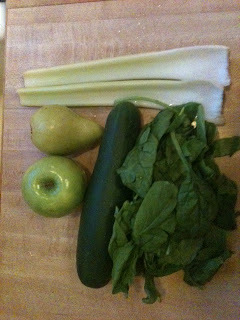 I have done the 3 day cleanse and I've followed the reboot but more recently I've been replacing breakfast with a juice. Below are some recipes that I've tried. Here's what I've learned along the way. My energy level was good. Most juices tasted better than I thought they would. Some, I have to be honest, were disgusting! I had to try different combinations to see what I liked so it is a bit of an experiment and you learn as you go. ***Remember to peel all citrus fruit. I also peeled my beets. 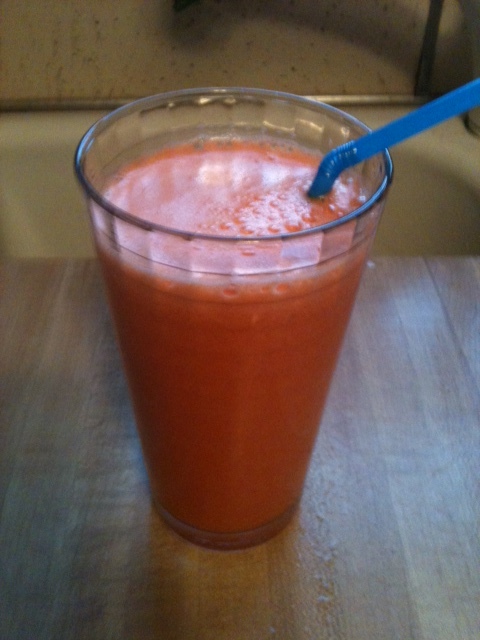 This one was 3 carrots, 2 oranges and 1 beet. I also added ginger root to this one and I really liked this a lot. It made a little more than this cup. 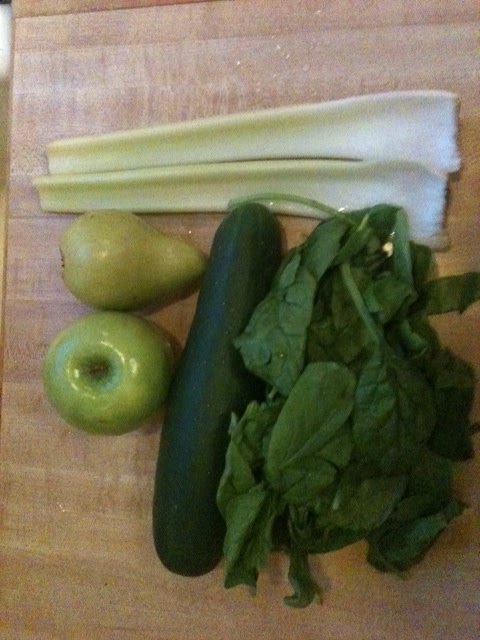 This contained 1 apple, 1 pear, 1 cucumber, 2 handfuls of spinach. I liked this one too. I found adding cucumber to the juices makes them taste lighter and more refreshing...at least for me. But the first was still my favorite of the bunch. This one is 2 grapefruits, 2 carrots and ginger root. This one was a FAIL! It was supposed to be a refreshing wake up breakfast kind of drink. Well, not so much. I drank it because I am not a waster but I did not like it, at all. It left me with a sour taste long after I finished. I usually love grapefruit but it was too much in this juice. I'm not sure why the picture is so small but like I said...It was NOT good. 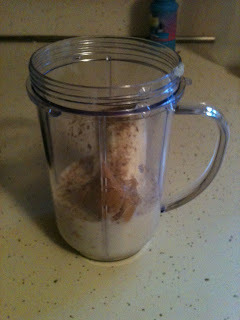 So if you're not in the mood for juicing There's always smoothies. This is my effort to add more fruits. I also found that my kids will drink some of these too. They are not inot the juices as much. This one was half a banana, 1 tablespoon peanut butter, 1/2 cup almond milk, 2 tablespoon ground flax seed. Since this is about pushing my limits the thing that I have done that impressed me the most so far was Warrior Dash This is an awesome obstacle course mud run that raises money for St Jude's. I felt so proud of myself at the finish line right after I jumped over the fire. That's right, I said fire :) I'm already signed up for the 2013 race. So now I'm wondering what will my next adventure be? Any ideas? My girls woke up this morning in the mood for pancakes and I looked in the cabinet for the Bisquick and there wasn't enough. So since we had spare time on this lazy Saturday, I decided to make homemade. So of course I headed straight to Pinterest. I also knew that I had some buttermilk left over so I figured let's really go for it. 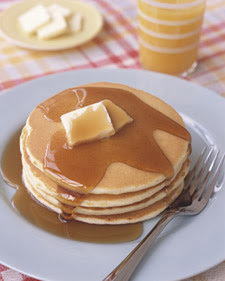 I discovered a recipe for IHOP like pancakes. I mean who doesn't love IHOP pancakes? Well mine did NOT come out like IHOP pancakes. The insides would not cook. I had them on low like the recipe said so I tried to leave them longer but then the outside became burnt. Only I could ruin pancakes. This one was a fail. Also, just to be clear I'm sure that it was me and not this yummy looking recipe. If you want to try I've included the link below. Well, I wasn't giving up so I turned again to Pinterest and decided to stay simple. So Martha Stewart's recipe to the rescue. This one was perfect and easy. I don't know if I'll buy ready made pancake mix again. Here's the recipe. I added vanilla and some chocolate chips. This is what my vacation was filled with. After the holidays there was a snowy day and time just being with my girls. It was wonderful! We headed back to work and school and that alarm at 5:45 came much to quickly for someone who had been staying up later than she should. I feel like I still haven't joined the real word and I'm a bit lazy with the whole family on vacation. I'll get there soon...I promise. Our favorite gifts were a karaoke machine which I see getting a lot of use and will have me wondering what I was thinking when I hearing Call me Maybe for the millionth time. I'm kidding, well kind of. I love and that it makes them happy. I also have to admit that I may have belted out a tune or two with them even though I can't sing. Now that I teach kindergarten I've left that at the door. I sing everything now. The other was our magic kit. They are both amazed by their own skills. I love that they are so proud when they get the trick right. These two are the best gifts I've ever received. I can't imagine life without them...even when they're making me crazy. It was a perfect holiday full of family visits and wonderful memories. Next up we will be ringing in the New Year with the kids. I don't even remember what going out to celebrate the new year is like. We'll be eating pizza bagels and toasting with sparkling cider long before midnight but I would not have it any other way. I also found this super cute printable for the kids and it has been updated for 2013. I'm trying so hard to get into the holiday spirit. The tragic events in Newtown have really made me reflect on life. I know once my girls wake up things are going to move quickly and I wanted to take these few quiet moments I have to think about how lucky I am and how grateful I am for all that I have. I know like a lot of people this tragedy tore me apart inside and I am changed forever. As a mother, teacher and just a person in general life is different. 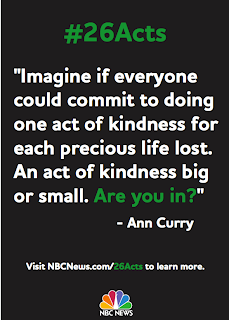 I've decided I'm joining in on the 26 acts of kindness a movement started by Ann Curry. I can't think of a better way to honor the beautiful lives that were lost than by spreading kindness. I'm back! This is going to be one of my resolutions for the year. I loved having a online photo journal for myself of all the memories from the year and looking back at the fun things that my girls and I had done. I was also missing all my blogging friends. Hopefully some of you are still here and are willing to take me back. I thought I'd start by sharing one of our attempts at a Christmas card. I promise we eventually got a better one but it's really hard to get two kids and a dog to get a decent picture. I have to be honest, Sonny (my dog) was probably the most uncooperative one in this photo shoot. He is still cute though even with his tongue out. Also for big news my baby brother graduated from the police academy in NJ. We all went to go support him at his graduation and apparently we all wore our green coats. I'm so proud of him and now he goes on to become a game warden. My middle brother is newly engaged and we will be celebrating that wedding on July 3rd. It's sure to be a beautiful day that I am very much looking forward to and so are my girls. They will be flower girls. And for those who are predicting along with the Mayan I just saw a good one...People are making Apocalypse jokes like there's no tomorrow.